The back of your throat may contract when something touches the area around the tonsils, the back of the tongue and the back of the throat. This reflex prevents something that is not part of normal swallowing to enter your throat. Sometimes, you really do not want this reaction to occur, especially when your dentist is trying to fix a dental issue. Is it possible to learn how to stop gag reflex? Many people think they feel gagged when something touches a sensitive spot in their mouths or throats, but that is not the case actually. Researchers have explained the gag reflex in two ways–psychological and physiological. It is physiological because your body is programmed to expel anything that slides too far down your throat. It is more psychological when you react to situations like vomit. Have you ever felt like throwing up just by watching someone puke? That is psychological side of a gag reflex. Both types of gag reflex are perfectly normal and help prevent any foreign object enter your throat and cause any harm. Here are some ways can help stop gag reflex. A tough thumb-squeeze will go a long way in helping you stop gag reflexes. All you have to do is encircle your left thumb in a fist. This will help counter a strong gag reflex. It works because the pressure placed on your thumb distracts your mind and makes you forget about the invading tool at hand. This will also help ease the throat muscles and make dental work a lot easier without any gagging. 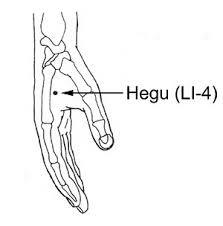 The concave soft point between your index finger and thumb is called the Hegu point. You need to apply pressure to this area to stop the effects of gag reflex. This allows for deeper intrusion into the throat without having to feel any gagging sensations. Research shows that pressure placed on this point allows people to tolerate dental procedures of up to 20 minutes long. Many people ask how to stop gag reflex when hands do not help. The other alternative is to turn to your face and utilize another acupressure point between your lower lip and chin. Simply, place your finger on the groove and apply pressure gradually. Doing this helps because it relocated pain and takes your mind off what is happening in your throat. It may be a painful option but it works quite well. If you choose to numb your soft palate, this may help suppress gag reflex. This can be done by using a desensitizing throat splash or a gel that is used to ease tooth torment. With your soft palate becoming less touchy, it is possible to continue with the procedure for 60 minutes or even longer. As mentioned earlier, the gag reflex is the combination of psychological and physiological reaction, but sometimes mental perspective plays a prominent role. It means that if you have had a bad experience at dentist's office previously, you are more likely to have it again because the same thing is playing on your mind. All you have to do is relax yourself. You can also use techniques mentioned above to understand how to stop gag reflex. While using those techniques, be sure to practice controlled breathing to relax your mind. Breathing through your nose will also help prevent gag reflex. Consider using a nasal decongestant before going for a procedure. This will clear your nasal passageways and make it easier for you to breathe. In addition to the points mentioned above, you can also find other tips to understand how to stop gag reflex. Avoid eating anything just before a procedure that may induce a gag reflex. Look for exactly what triggers a gag reflex. It could be the tooth glue if you experience it when brushing your teeth; or it could be your cleanser if your gag reflex occurs in the shower. Maintain a diary to know exactly what triggers a gag reflex. Just spend a few minutes writing when the gag reflex appears. Be sure to keep your fingers away from your throat because that always causes gagging and heaving. You need to bear in mind that the gag reflex is normal and is in fact your body's normal response to protect you from stifling. Do not go too far when disengaging the gag reflex using a toothbrush. Talk to your doctor and ask them to share the best ways to suppress gag reflex. If you experience over the top gagging, this could be due to an underlying health condition, such as Gastroesophageal Reflux Disease.